LMU researchers have elucidated how a cellular sensor that triggers the innate immune system distinguishes viral from cellular nucleic acids – and why it must expend energy to do so. The mutant virus sensor RIG-I E373Q (magenta) bound to an exposed double-stranded region (red) of the ribosomal RNA [gray (orange): large (small) ribosomal subunit]. Source: Sarah Matheisl and Charlotte Lässig. Viruses essentially consist of a protein coat that encapsulates the viral genetic material – usually one or more molecules of RNA. During an infection, the only viral component that actually gets into the host cell is the RNA (the coat protein is stripped off). But vertebrates like ourselves have an innate immune system that can detect viral intruders and initiate appropriate countermeasures. An immune sensor called RIG-I (the protein encoded by retinoic acid-inducible gene I) recognizes the foreign RNA and activates an immune reaction against the virus. But since host cells are themselves full of RNAs that are essential for their survival the identification of exotic viral RNA is no easy task. “We had already shown that the process is based on the recognition of two specific structural features of viral RNAs, as Professor Karl-Peter Hopfner (LMU Gene Center) explains. “But this finding alone did not fully explain exactly how RIG-I discriminates viral from cellular RNA,” he adds. Now Hopfner and his research team have shown that RIG-I must be actively removed from cellular RNA in order to prevent it from triggering false alarms. The new findings appear in the online journal eLife. The breakthrough came with the recent discovery of a mutation in RIG-I, which deprives the protein of its ability to hydrolyze bound ATP. This mutation turns out to be the underlying cause of Singleton-Merten Syndrome, a rare form of autoimmune disease characterized by tooth loss, bone demineralization and calcification of the vasculature. Hopfner’s team has now shown that the mutant form of RIG-I is also unable to tell the difference between friend and foe, such that the RIG-I-dependent signal relay is activated by cellular, as well as viral, RNA molecules. “So we took a closer look at the set of cellular RNAs that interact with the mutated form of RIG-I,” Hopfner continues. And to everyone’s surprise, we found that the mutant RIG-I localizes to the ribosomes, which serve as the cell’s protein factories. Ribosomes are made up of proteins and RNAs, and the mutant RIG-I binds predominantly to a double-stranded stretch of RNA that extends from the ribosomal surface. 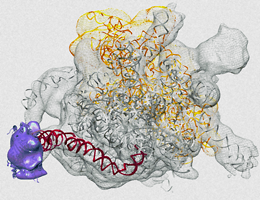 With the help of Hopfner’s colleague Prof. Roland Beckmann and his team, RIG-I could be located on a Ribosomal RNA element by using cryo electron microscopy. “We concluded from this finding that RIG-I must hydrolyze ATP in order to detach itself from cellular RNA. If this mechanism is defective, RIG-I binds to double-stranded regions in cellular RNAs – in particular to those associated with the ribosomes – and the continuing activation of the signal cascade precipitates an autoimmune reaction. This discovery could contribute to the development of new therapeutic possibilities in the future,” Hopfner says. The work was carried out in the context of the Excellence Initiative with the support of the Center for Integrated Protein Science Munich (CIPSM), a Cluster of Excellence and the Graduate School of Quantitative Biosciences Munich (QBM), and with assistance from the Research Network for Molecular Biosysstems (BioSysNet).